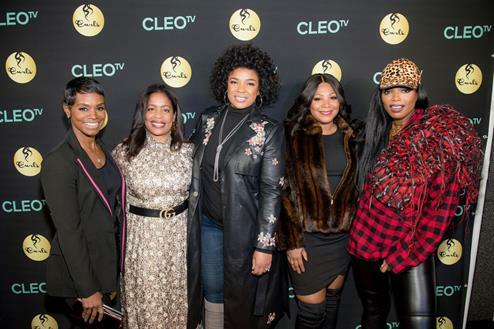 Sister Circle Co-Host Rashan Ali, TV One General Manager Michelle Rice, Sister Circle Co-Hosts Syleena Johnson and Trina Braxton, and CLEO TV Host/Personality Tai Beauchamp at the CLEO TV preview celebration in Atlanta on November 29. ATLANTA, GA – December 4, 2018 – Celebrities, influencers, advertisers and TV executives turned out for TV One‘s private event held in Atlanta to celebrate and introduce new entertainment network, CLEO TV on Thursday, November 29. Derived from the name Cleopatra, CLEO TV is an aspirational lifestyle and entertainment network targeting Millennial and Gen X women of color. The network promises a unique and diverse lineup of short and long-form programming that reflects the multifaceted interests of this generation. With a bold, fearless and fresh take, CLEO TV gives multicultural young women a destination for content centered around travel, home design, relationships, finances, cooking, talk shows, movies, docu-series, sitcoms and much more. CLEO TV will be broadly distributed on Comcast Xfinity beginning January 19, 2019, with additional affiliate distribution agreements to be announced in the coming months. TV One Executives in attendance at the event included General Manager Michelle Rice, EVP of Ad Sales and Marketing Rahsan-Rahsan Lindsay, SVP Marketing Lori Hall, and SVP Public Relations Tosha Whitten-Griggs. CURLS Beauty Brands Founder Mahisha Dellinger, a CLEO TV launch advertiser, was also present. VIPs in attendance at the event included Chef Jernard Wells (CLEO TV Co-Host, New Soul Kitchen), Tai Beauchamp (CLEO TV Host/Personality), “Sister Circle” co-hosts Syleena Johnson, Trina Braxton, Rashan Ali and Demetria McKinney (Saints & Sinners, Bobbi Kristina).